ITS User Support & Engagement strives to provide the highest level of customer satisfaction through effective, reliable and professional IT support, in partnership with campus units. The division advances the University’s role as one of the nation’s leading public universities by providing continuous service improvement and leveraging technology efficiencies and expertise. A dedicated Business Systems Help Desk provides support ConnectCarolina and InfoPorte users. The Business Systems Help Desk representatives have received extensive training in ConnectCarolina Finance and HR/Payroll and in InfoPorte. While the ITS Service Desk is available 24/7, and you may submit a help ticket at any time, the Business Systems Help Desk is staffed Monday – Friday, 8 a.m. – 5 p.m. ConnectCarolina and InfoPorte tickets may only be worked during normal business hours. As part of the University’s coordinated technology plan, the Carolina Computing Initiative (CCI) aims to ensure that Carolina students, faculty and staff have easy access to high-quality and affordable technology and can use it effectively. At the center of the initiative is the requirement that undergraduates at UNC-Chapel Hill own laptop computers that meet University specifications. The Computer Repair Center (CRC) is a Lenovo-certified, Dell-certified and Apple-authorized computer repair center, located on campus. We provide students, faculty, and staff with the quickest possible computer hardware repair of their Apple, Dell and Lenovo model laptops and desktops. 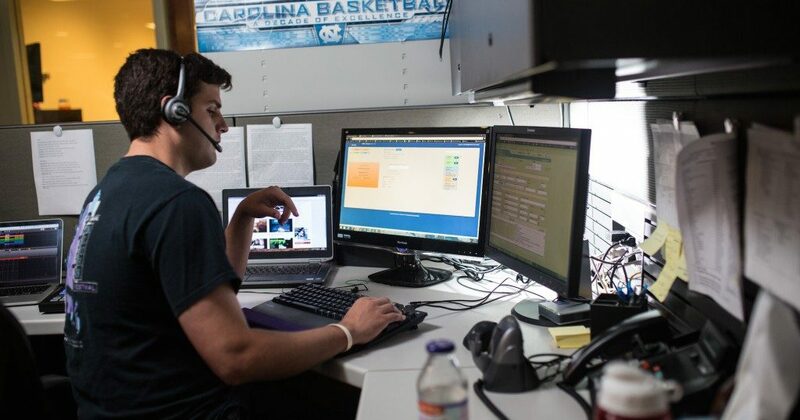 The ITS Service Desk provides technical and customer support to UNC-Chapel Hill students, faculty and staff as a single point of contact. Customers can access services via phone, live chat, walk-in, web and social media engagement. Students, faculty, staff, retirees, prospective students, parents and University affiliates. Walk-In Services is intended to support students, faculty, and staff with their personal and institutional technical support needs at our Undergraduate Library and SASB locations. Managed Desktop Services (MDS) provides professional, efficient, customer-centered onsite, and remote IT support with an emphasis on security and reliability. MDS provides all aspects of desktop and user-centered computing support for faculty, staff, and administrators. Within this scope, MDS not only provides ‘fixers’ for technical support needs; we provide consultative services to aid in customers’ use or adoption of existing and new technologies to best suit their needs to advance UNC-Chapel Hill and department goals. For needs beyond the scope of MDS services, MDS serves as your customer liaison for ITS and other services. The Remedy Development and Services team supports the faculty, staff, and students of UNC-Chapel Hill by providing customized applications, using the Remedy Action Request System (ARS) development environment. These applications are developed to support technology usage at Carolina. ResNET provides on-site IT support, education and the technology infrastructure for the UNC-Chapel Hill residential communities. The ResNET staff is committed to enhancing the intellectual environment to support the University’s vision. Visit resnet.unc.edu for more information. The goal of ITS Software Acquisition is to provide a single, centralized point of contact where information about University site licenses may be obtained. Visit software.unc.edu for more information.